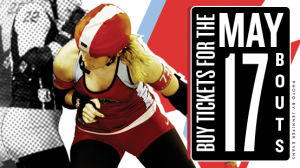 You definitely won’t want to miss the action at this Saturday’s double-header as the Atlanta Rollergirls welcome two visiting teams to our home turf, the Classic City Rollergirls of Athens, GA and the Minnesota Rollergirls of St. Paul, MN. ARG’s locally competitive team, the Jukes of Hazzard, will be playing their first ever home bout, with the Classic City Rollergirls of Athens, GA as their opponents. ARG and CCRG have long considered themselves neighbors. Some of our league’s best players are CCRG alums. In fact, former Classic City Rollergirls Helga G. Pa-SMACK-i and Mosh-ya Brady will duke it out against their former leaguemates during this very bout. The Classic City Rollergirls’ roster boasts three members of Team Georgia Roller Derby: Super Smash Fro, Human Missile Crisis, and High Jinxxx. All of whom, along with their teammates, are sure to mean business! In Bout 2, our internationally competitive All-Star team, the Dirty South Derby Girls, will take on the formidable Minnesota Rollergirls’ All-Stars for the first time. MNRG will travel over a thousand miles to play DSDG, and we couldn’t be more excited to welcome them. The Atlanta Rollergirls and Minnesota Rollergirls are both celebrating their tenth seasons this year. What better way to mark that milestone than a showdown on the track? 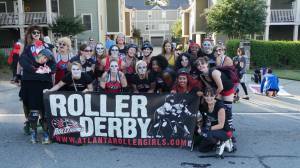 We asked Dirty South Derby Girls’ trainer (and Atlanta Rollergirl), InSINerator, for her thoughts on the challenge ahead. Any time you get the opportunity to take the track and bout, it’s a good thing. But to play a top level team such as Minnesota is even better! DSDG’s season has really only just begun, so to play Minnesota for our 3rd game will be a great test for the team. There is no doubt that Minnesota will bring their ‘A’ game on Saturday. DSDG has their sights set on Champs at the end of the year and has been working hard to not only strengthen their assets but also to introduce and develop additional skills and strategies which will bulk up the team’s toolbox. The bout this weekend will provide valuable information for the team to evaluate our training goals and determine what tweaks might need to be made to best prepare DSDG for Champs. What worked? What didn’t? What can we do to be better? Our DSDG rookies have hit the ground running and merged wonderfully with the vets. Team chemistry develops from quantity and quality of track time with teammates. Bouts provide a high intensity quality track time that is essential in fostering team chemistry. Regardless of who we’re playing, the challenge remains the same- ‘Play OUR Game!’ Each opposing team brings elements of the unknown and the unexpected. The challenge for DSDG will be to remain focused from start to finish on the DSDG game plan. When DSDG centers themselves around the fundamentals of our game plan, amazing things happen. Can’t wait for Saturday! We can’t wait either! There’s still time to get your tickets to what will be an amazing night of derby! Doors open at 4:00pm for the Jukes of Hazzard vs. Classic City Rollergirls with teams taking the track at 5:00pm. The DSDG vs. Minnesota Rollergirls bout will follow at 7:30pm.